So you found the perfect dress. The only problem is that it is too small. “No problem!” says the sales clerk. “It can be altered. We will take a little from the train, add it to the sides and Presto!” Is this really possible? Perhaps. The truth is you will be a very unusual bride if you did not need some wedding dress alterations. But how much can a wedding gown be realistically adjusted? And how much will it cost? Most wedding dresses need some adjustment, and unless your wedding gown does not have a train, at the bare minimum it will need bustles sewn in the back. 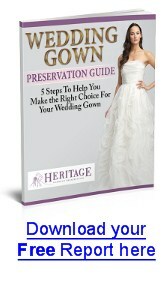 So be prepared for add a bit more onto your wedding gown costs than the price tag states. The average a bride spends between $75 and $250 on alterations. If you know the wedding dress alterations you will need, feel free to call around and get some telephone bids. You do not necessarily have to use the alterations service from your bridal shop, but do not cut corners that you might regret. A seamstress experienced with altering wedding dresses will probably do a better job than your average tailor at your local dry-cleaner. Wedding Dress Alterations For Any Dress? It is easier to take something in than it is to let it out. If you are wearing your mother’s wedding dress it may be worth going to great lengths to get the gown to fit to you. But, if you are buying a new wedding dress, get the correct size. Making a dress larger is difficult, and you may not like the fit afterwards. Don’t buy a wedding dress more than one size larger than your own size. Larger wedding gowns are cut proportionally larger all over the gown. The neckline, the bodice, and shoulders will all be over sized. This means the wedding gown may not fit quite right if only the side seams are taken in. However, some dresses are designed to fit several sizes, with a corset back that ties instead of zips. To get the best fit, stay as close as possible to your correct size. Could I Do The Wedding Dress Alterations Myself? If you (or a friend or family member) are a competent seamstress you could make many of your alterations easily and save quite a bit of money. For instance, a hem from a professional tailor might range from $55 for a very basic hem to $200 for multiple layers but might not be a difficult chore for someone who knows their way around a sewing room. It all depends on the construction of the wedding dress. Hems can be very simple, but be aware that if your wedding dress has lace at the hemline, it may require more extensive work. Some alterations are more difficult and should be reserved for someone who really knows what they are doing. But wedding gowns are designed to be altered and many are constructed in such a way as to make adjustments easier. Take a good look at the interior construction of your wedding dress to determine how difficult it will be to make the necessary adjustments before you take it on. Try your wedding dress on without any make-up. You want to be as clean as possible to avoid soiling your gown. And wear your nicest under clothes as it is likely you may be only partially dressed during your fitting. Keeping these tips in mind will help you when selecting your gown and your tailor. And remember, for a less stressful wedding preparation, shop early for your wedding dress. Once you have your wedding dress, be sure to store it in an acid-free environment. Our 100% cotton garment bag works great for this. Your special day will be here before you know it. Want to use this article in your ezine or web site? You can as long as you include the copyright notice above and a link to our website.